This month's tag combined two styles from the past three years. The first technique used distress stain with a brayer to create a fluid color effect for the base of the tag. The second style was a frameworks die cut that placed geometric designs on a second layer. I chose to use a Stampendous sunflower stamp colored with alcohol markers for a contrasting image over my cool purple and blue tones. 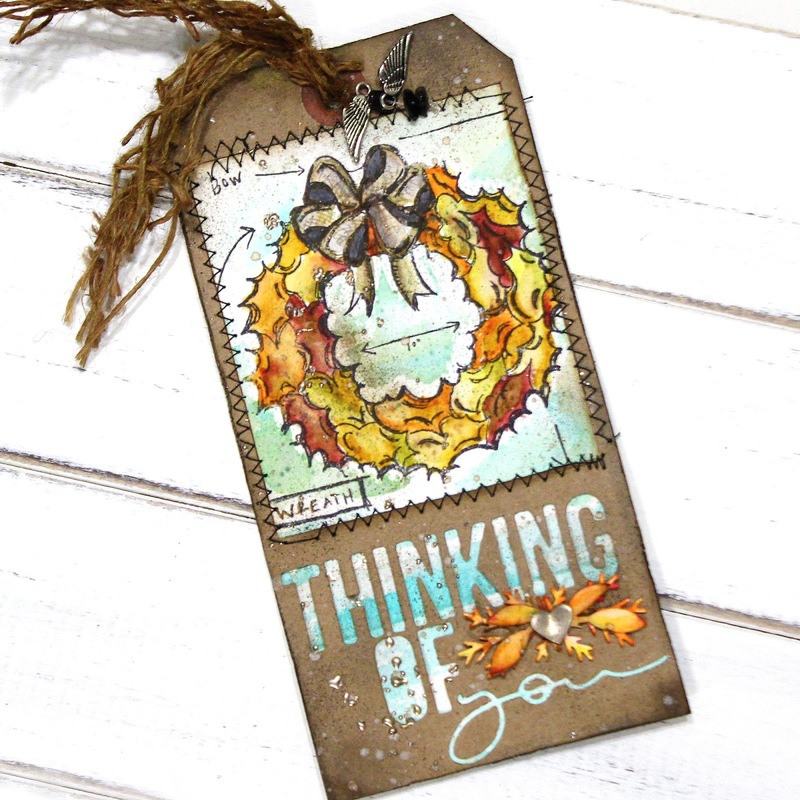 The word band is from Tim Holtz and has a great sentiment to complete the tag. This month the tag challenge was a remix of two previous techniques. The first method was using watercolor resist. 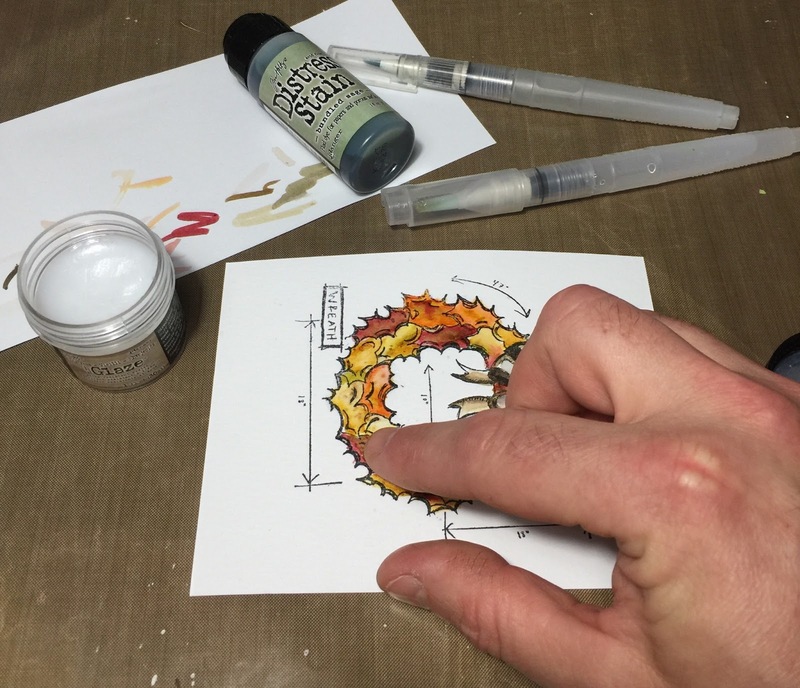 The recommended product was Tim Holtz's MicroGlaze. It works with distress inks, watercolor and distress stains. The next technique was layering words using cut-outs and dies. This was my absolute favorite part of the tag. I used the Thinlits die by Tim Holtz and Sizzix. This die is easily one of the best I've used. The versatility and affordable price make it a die you'd use over and over again. Distress Markers are a quick and easy way to add bold water reactive color in detailed areas. When using distress markers you want to use a permanent water resistant ink with your stamp such as Ranger Archival or Versafine by Tsukineko. The distress MicroGlaze is a great medium for applying over water soluble inks and stains to create a resist. Without using this resist medium, brushing color over the image would blend all the colors together. I find it's a great product to use when combining a lot of distress products together on one image to avoid smearing. I'd love if you'd leave any questions or comments in the section below. 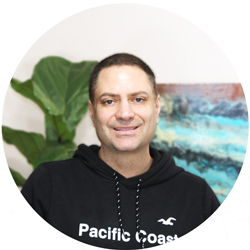 I'll also be happy to provide any info on products used. Hey guys! 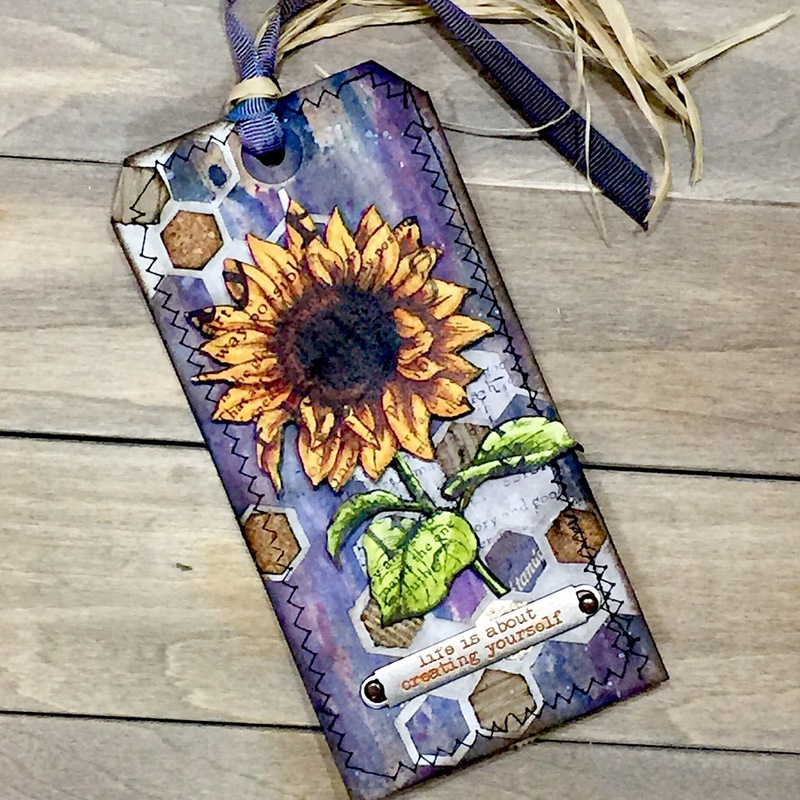 I want to share with you another tag from this months Tim Holtz 12 tags of 2016 challenge. June's tag's theme is a remix of two techniques. The first technique uses tissue and substrate. Both are really great surfaces to work with. I love Tim Holtz's printed tissue paper. This stuff is awesome. 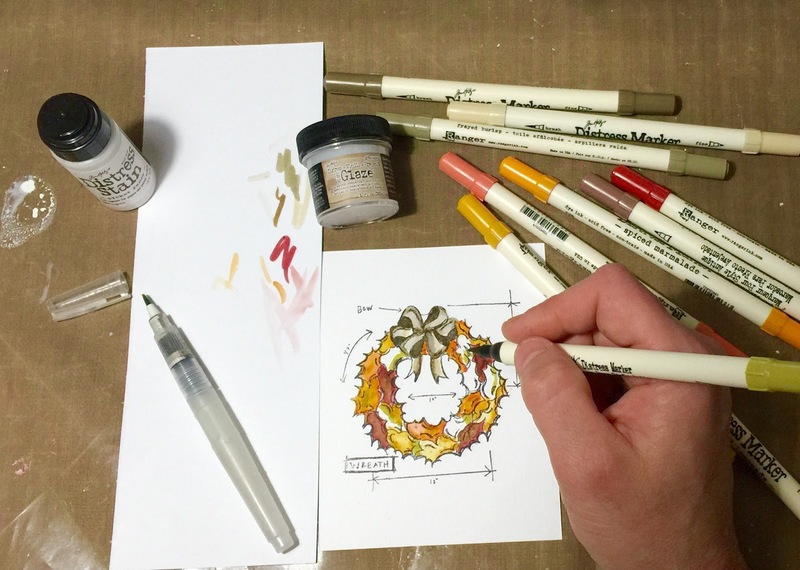 Not only is it great for mixed media art but it adds a real artistic flair to gift wrapping. To think, all these years I've been using plain tissue paper! The next technique uses plaid stencils on textile paper. Both of these were great fun to experiment with. 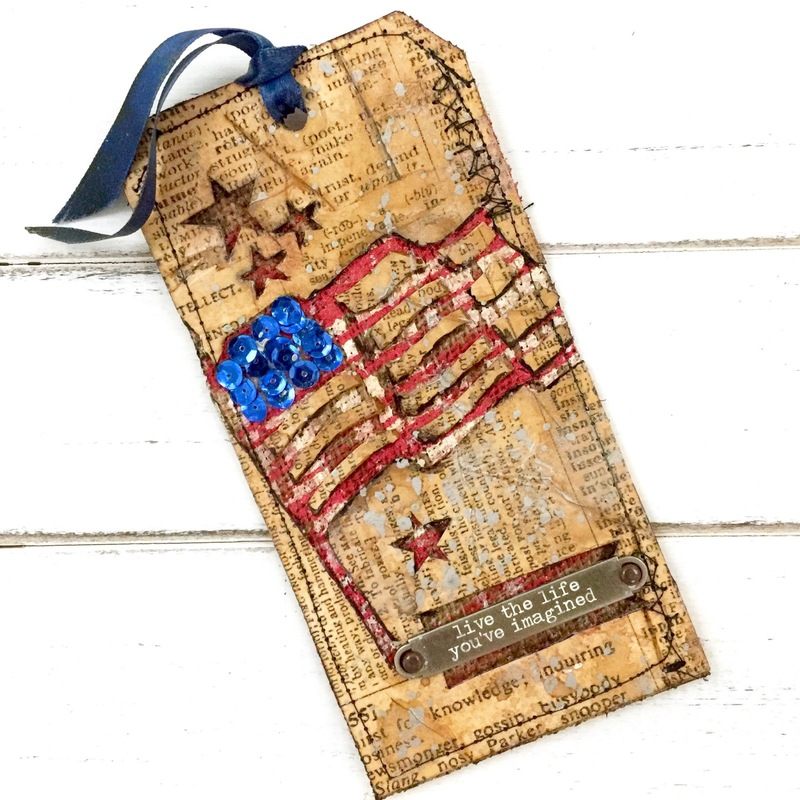 I also used a die of an American flag to add dimension to the burlap paper which I decoupaged onto the manila tag. I used a word band from the Tim Holtz idea-ology collection. The saying was perfect for the patriotic them of the tag. The phrase is the epitome of the American dream. or ideas in the comment section below!